Here's something you don't see too much of nowadays. The M51 "Fishtail" Parka was standard issue in the US Army before the new Gore-Tex stuff. Some might say this is still better suited to certain conditions. These are well made reproductions of the originals. Note: the newest production run is missing the US ARMY tag and the blank name tag on the front. However, the fabric is better. 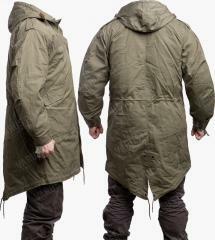 As an overgarment for extreme cold weather, the M51 parka is cut very roomy - it is designed to be worn on top of everything from the underwear and a field jacket. It has a hood and drawcord adjustments and button tabs at all the necessary spots. The "Fishtail" is essentially fabric extensions which wrap around the legs for superior insulation and protection. 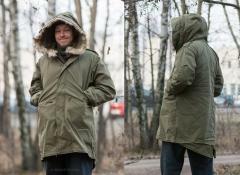 Compared to Gore-Tex jackets, the old Fisthail Parka still has some advantages, of which the main one is the lack of waterproofing - where this parka is needed, it won't exactly be wet. While Gore-Tex also lets vapors through, it can't be compared to standard non-waterproof fabrics in breathability. These are made of thin, windproof polycotton blend, while the liner is polyester batting between two nylon layers. The sizes run large. We have given the measurements for both user's height and chest circumference in centimeters. 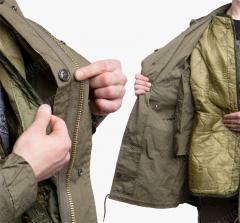 By sticking with our numbers, you can still fit some other clothes under the parka. 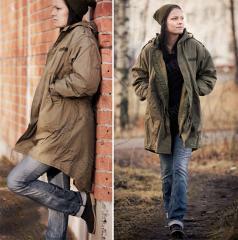 The model in the picture is 170 cm tall and has a chest of 100 cm, he wears a size X-Small Regular, which fits as good as a parka can. Made by Mil-Tec, surprisingly good reproduction of the original. The liners are usually original US Army items, and may have just a tad different buttonhole arrangement (i.e. a button or two might not line up perfectly). Still perfectly usable. 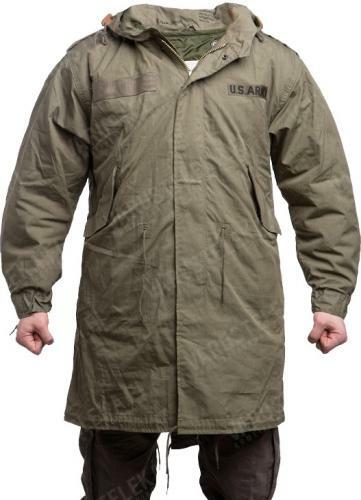 After the rough lessons on cold weather provided by World War 2, the US Army rapidly developed the M-1951 parka, which saw extended use in the Korean War, were it certainly proved itself. 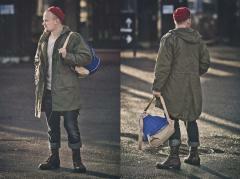 As the M-1965 system became the new standard, the parka got some minor updates and was reborn as the M65 Parka. The use of components from the M65 system stopped when the new ECWCS stuff was made in sufficient numbers to replace all the old stocks.